Do you keep forgetting your daily medicine?? 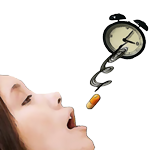 Never forget to take your medicine anymore with "Med Time" android application. With "Med Time" you can easily create medication notifications for yourself or others in simple and easy to use interface. Add a reminder. That's it! At schedule time, this app will send a notification to remind you. Do you want to send reminders to your friends/family about their medication? Create a reminder with their medicine details, choose Send SMS option and provide their mobile number. At schedule time they will receive SMS. (Note: SMS will be sent from your mobile. We don't send any messages unless specified). You can choose upto 6 doses per day. No need to open the notification and check the medicine details. Select this option! At the reminder schedule time, Med Time will read out the medicine details. Do you have any important meeting/appointment? Select this option to turn off notification sound and Text to Speech. Do you have daily meeting/appointment at particular time? Select this option and set start time and end time. This will turn off notification sound and Text to Speech. You can choose your preferred notification tone. You must exclude Med Time from your task killer if you have one installed. Please contact us if you have any issues or suggestions.